On August 14, 2014, five days after the fatal shooting of Michael Brown ignited race riots throughout the city of Ferguson, Missouri, the nation found an unlikely hero in Captain Ron Johnson of the Missouri Highway Patrol. Charged with the Herculean task of restoring peace between a hostile African American community and the local police, Johnson, a 30-year law enforcement veteran and an African American, did the unthinkable; he took off his bullet-proof vest and joined the protesters. The 13 days and nights that followed were the most trying of Johnson’s life―professionally, emotionally, and spiritually. Officers in his own command called him a traitor. Lifelong friends stopped speaking to him. The media questioned and criticized his every decision. Alone at the center of the firestorm, with only his family and his faith to cling to, Johnson persevered in his belief that the only way to effectively bridge the divide between black and blue is to―literally―walk across it. 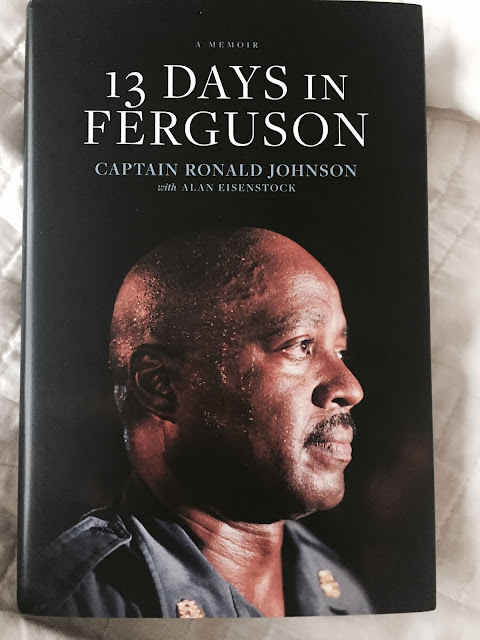 In 13 Days in Ferguson, Johnson shares, for the first time, his view of what happened during the thirteen turbulent days he spent stabilizing the city of Ferguson, and the extraordinary impact those two historic weeks had on his faith, his approach to leadership, and on what he perceives to be the most viable solution to the issues of racism and prejudice in America. My Thoughts: First of all I have to start by saying that I did receive this book from the publisher. This is a well written memoir from the perspective of a well known law enforcement officer, Captain Ronald Johnson. This book is thought provoking while at the same time an entertaining and relevant read. For sure a lot for readers to gain from this book. Copyright © 2011-2017 hannamarielei.com. All rights reserved. Powered by Blogger.